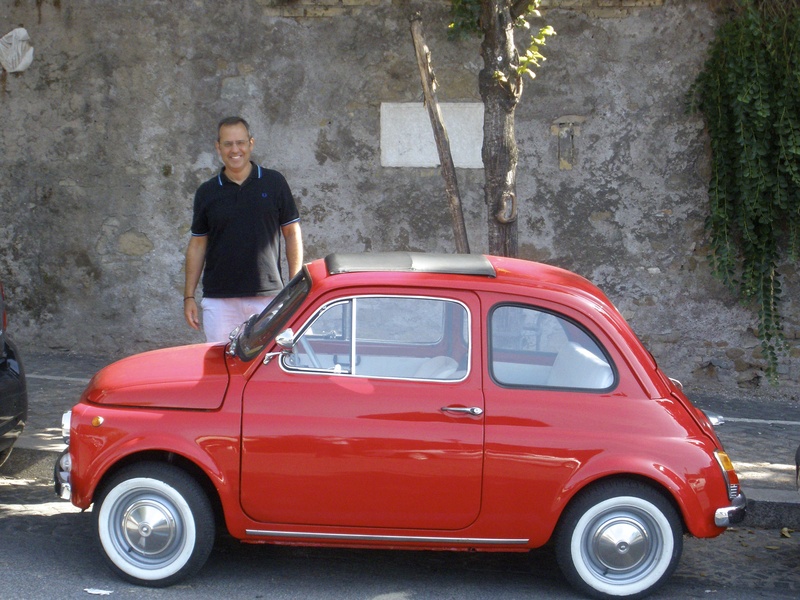 The Fiat 500, Cinquecento, is a city car designed by Dante Giacosa and produced by the Italian manufacturer Fiat (Fabbrica Italiano Automobili Torino) between 1957 and 1975. Launched as the Nuova (new) 500 in July 1957,it was a cheap and practical town car. Measuring only 2.97 metres (9 feet 9 inches) long, and originally powered by an appropriately sized 479 cc two-cylinder, air-cooled engine, the 500 redefined the term “small car” and is considered one of the first city cars. Like all tourists I can’t ever get enough of looking at or remarking on these cars as they go whizzing through Rome and all of Italy for that matter. Weekends seem to be the best time to spot these beauties especially those that have been restored and are in perfect condition. Balancing the desire to visit “must see sights” and to relax can be hard at times. Especially if you have a limited number of days in Rome. Visiting the Giordini Vaticani will allow you to do both in spectacular style! 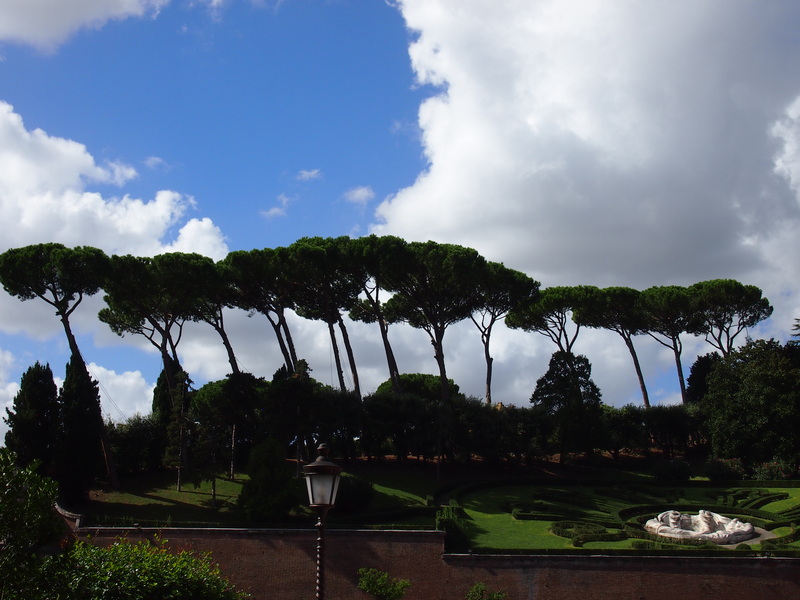 The views from the “backyard” of St. Peters along the upper terraces of the garden are nothing short of breathtaking. Open daily except Wednesdays and Sundays, from 9:00 am to 5:00 pm. 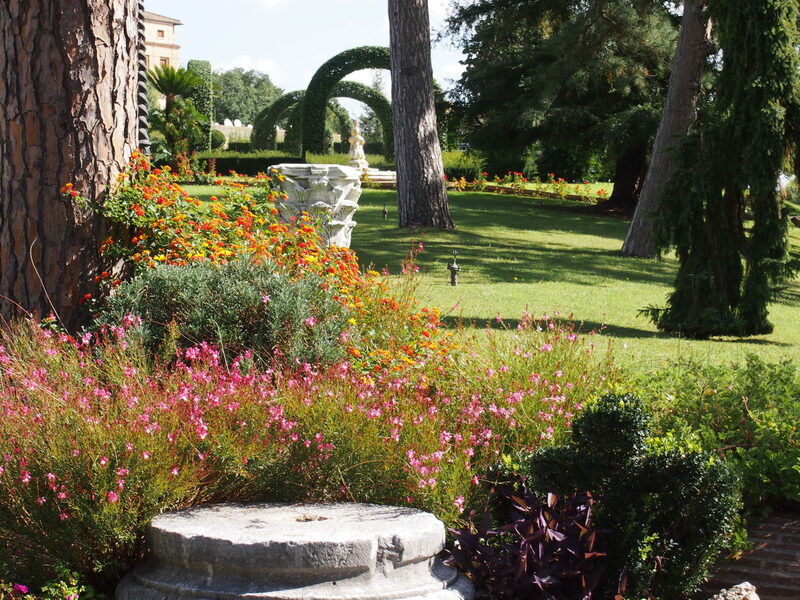 The guided tour, in small groups of 20 to 25, which lasts approximately two hours winds leisurely through the lush gardens, fountains, statuary, and architectural gems of Vatican City. The tour guides are friendly and knowledgable and provide you with a historical overview of this special place. 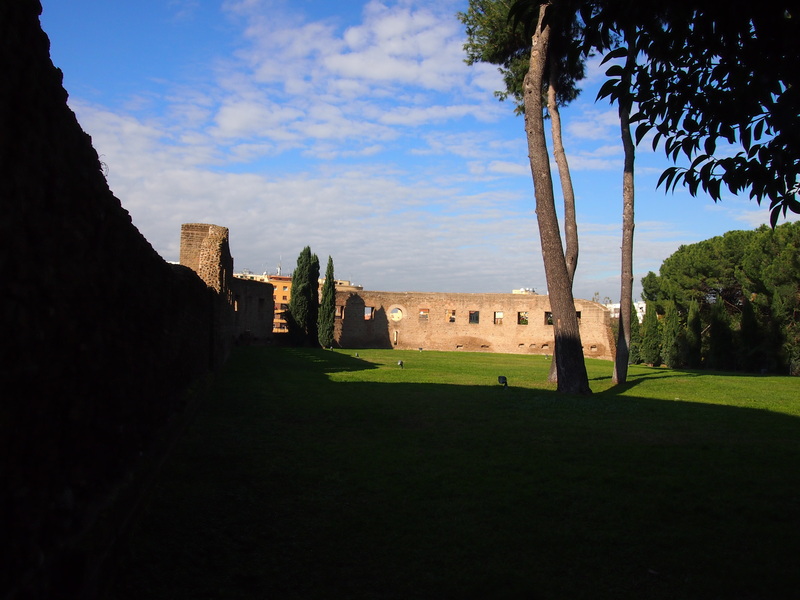 The Vatican Gardens have been a place of quiet and meditation for the popes since 1279 when Nicholas III (Giovanni Gaetano Orsini, 1277-1280) moved his residence back to the Vatican from the Lateran Palace. 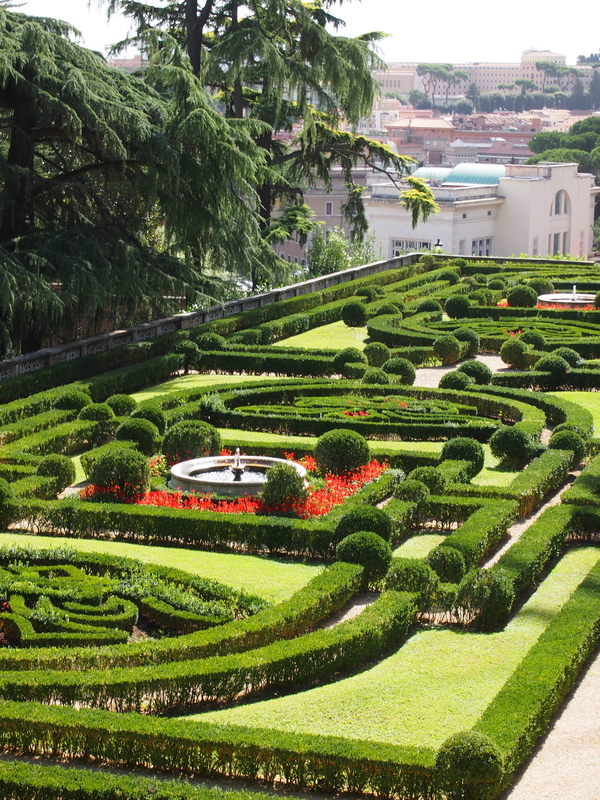 Within the walls of Vatican City these urban gardens and parks cover more than half of the 109 total acres of Vatican territory to the South and Northeast. The papal heliport, Radio Vatican, and the Vatican Train Station (no longer used) are just a few of the interesting buildings you will see. 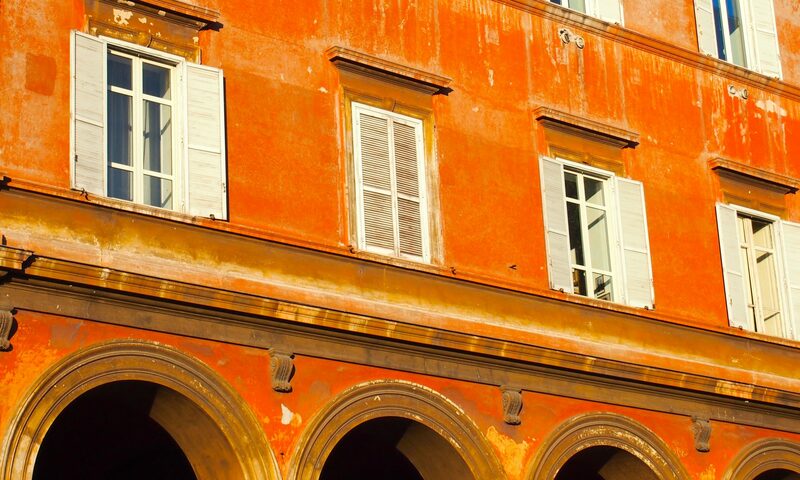 After your tour you may visit the Vatican Museums or you may want to avoid the crowds in the “front of the house” and continue to relax along the streets of rione Prati. One of my favorite places to have a panino is DUECENTOGRADI “200 Degrees”. Located a short five minute walk from the entrance to the Vatican Museums at Piazza Risorgimento, 3. Several years ago a dear friend Phyllis and her husband Stu met me, Joe, and Joe’s parents for an espresso in the town of Tavarnelle val di Pesa in the beautiful countryside of Tuscany. After relaxing and catching up we accepted their generous invitation to visit a friend Riccardo Casamonti and his vineyard. The drive through the countryside was a photographer’s dream with spectacular vistas in every direction. I am sure I asked Stu to stop the car on no less than 10 occasions so I could take a photo. The small vineyard, “Il Poggione”, is located very near the Castello di Tignano in the town of Barberino Val d’Elsa in the Chianti Region south of Florence. 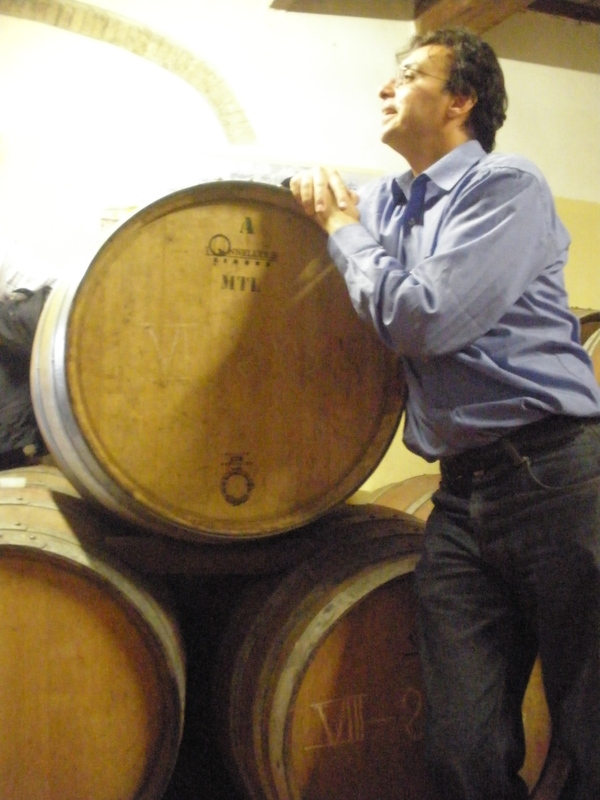 Riccardo produces 1,200 botles of wine annually and only on the best vintages such as 2006. 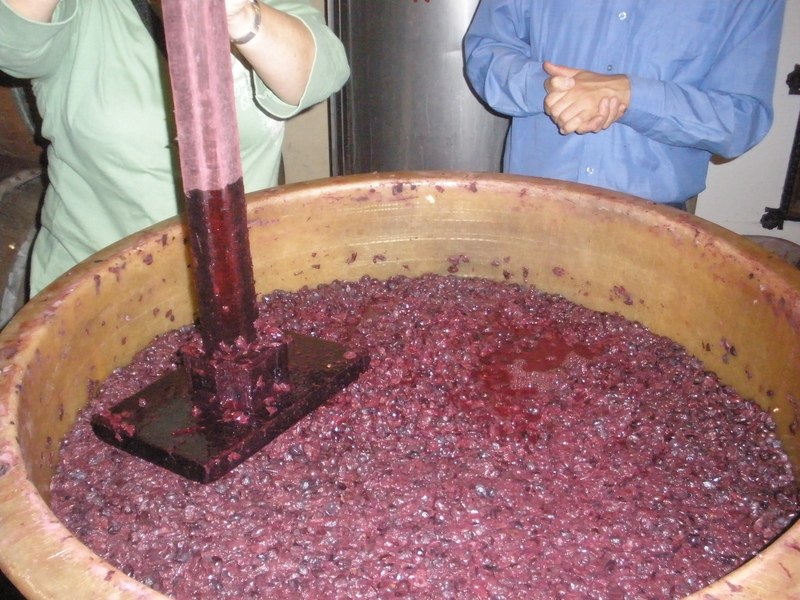 Among the wines produced is a wonderful Vin Santo, “holy wine”, a style of Italian dessert wine. 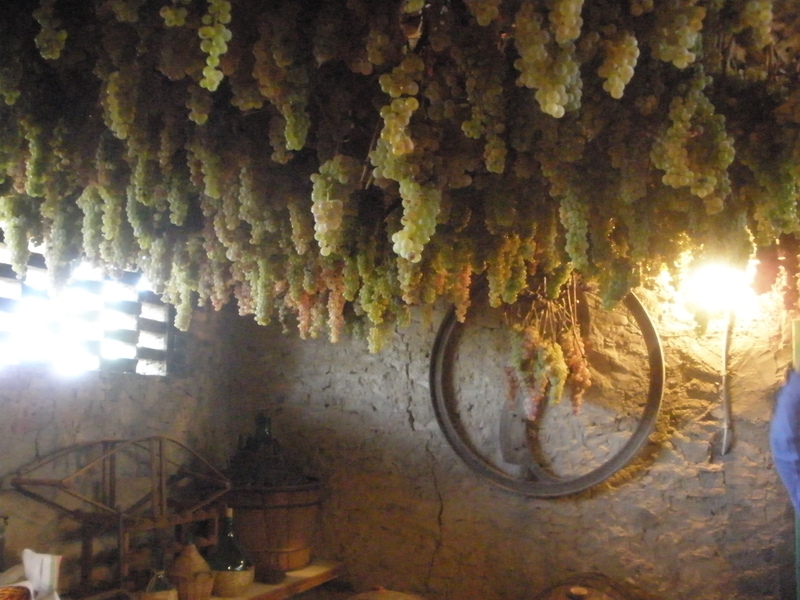 Traditional in Tuscany, these wines are often made from wite grape varieties such as Trebbiano and Malvasia. Riccardo couldn’t have been more welcoming as he showed us around the farm allowing us to experience wine making from harvest to press to tasting!! I enjoy escaping the hustle and bustle of the historic center of Rome from time to time. It is always an adventure and an opportunity to explore new neighborhoods. One of my favorite off the beaten path excursions is to a “complex” in the Trieste district – Chiesa Sant’Agnese fuori le Mura. Literally translated “Saint Agnes outside the walls”. 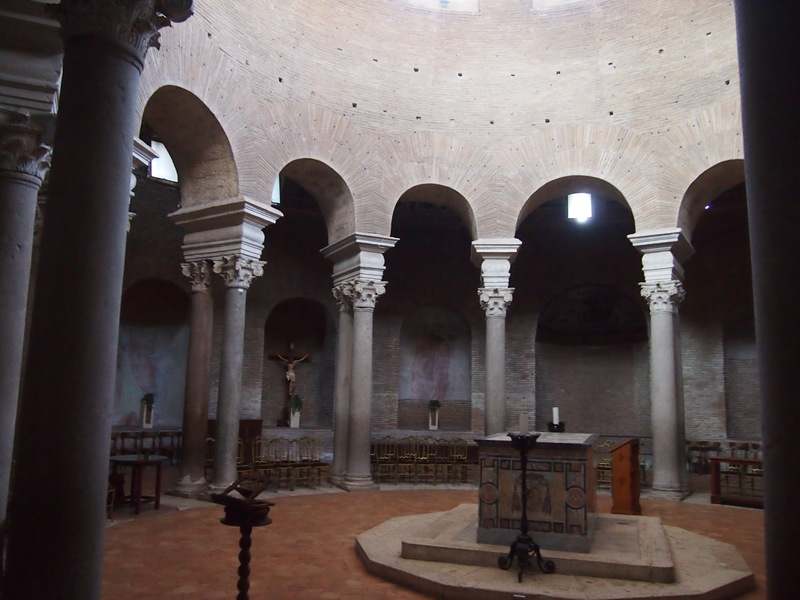 The complex includes an ancient church dedicated to the martyr Saint Agnes, located at Via Nomentana, 349, a funeary monument to Constantina – daughter of Emperor Constantine, catacombs, and the ancient remains of a monastery. The history that accompanies these structures is high drama in the best tradition. Roman nobility converting to christianity, martyrdom, miracles, poetry, and layers upon layers of art and architecture. Easily accessible by Metro (S. Agnese Annibaliano Station). 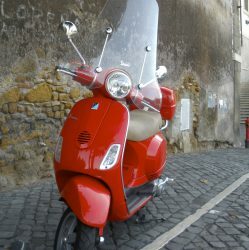 Take the MEB1 from downtown Rome towards Conca D’Oro. When you exit the station look eastward and you will see a hill with trees and an ancient wall. Head in this direction. Romans, like most of us, love to shop and I am not talking about window shopping! Outdoor and weekend markets, upscale clothing, kitchen wares, decorative design and furniture – there is something for everyone. Via Cavour, Via Condotti, Via Veneto, Via del Corso all great streets for shopping and worth a visit. One of my favorites, however, is Via Margutta. 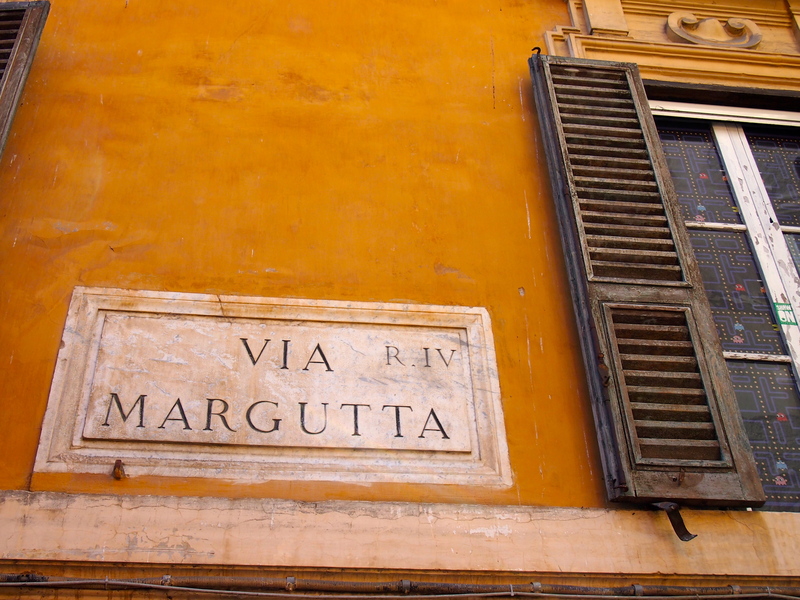 A narrow street in the historical center near both the Spanish Steps and Piazza del Popolo. Sometimes referred to a “the foreigner’s quarter”. Originally home to craftsman and artisans, workshops and stables, you will now now discover art galleries, restaurants, chic hotels, and boutiques selling decorative arts and clothing. Beyond Via Margutta there are several special shops that I discovered while living in Rome and would encourage you to visit if you have the time. Arezzo located in Tuscany in central Italy is about 190 km to the northeast of Rome near both Siena and Florence. 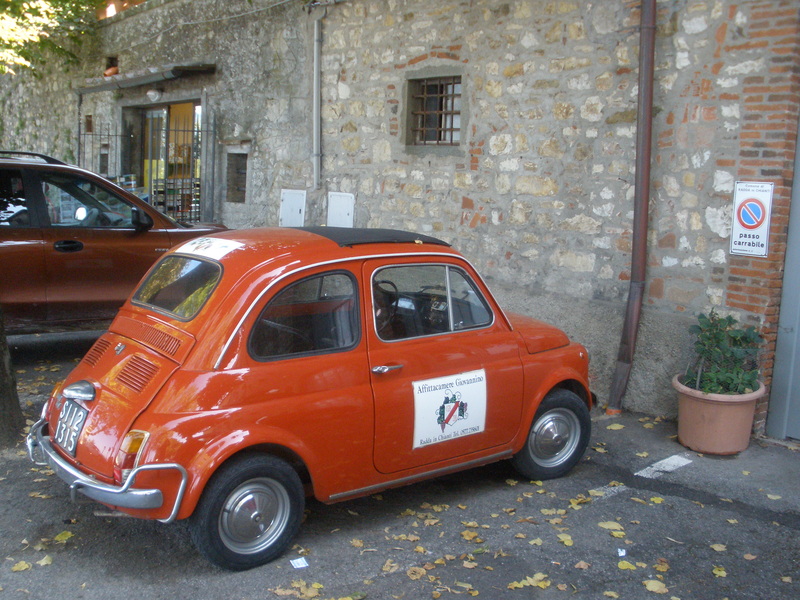 Several ways to get to Arezzo. 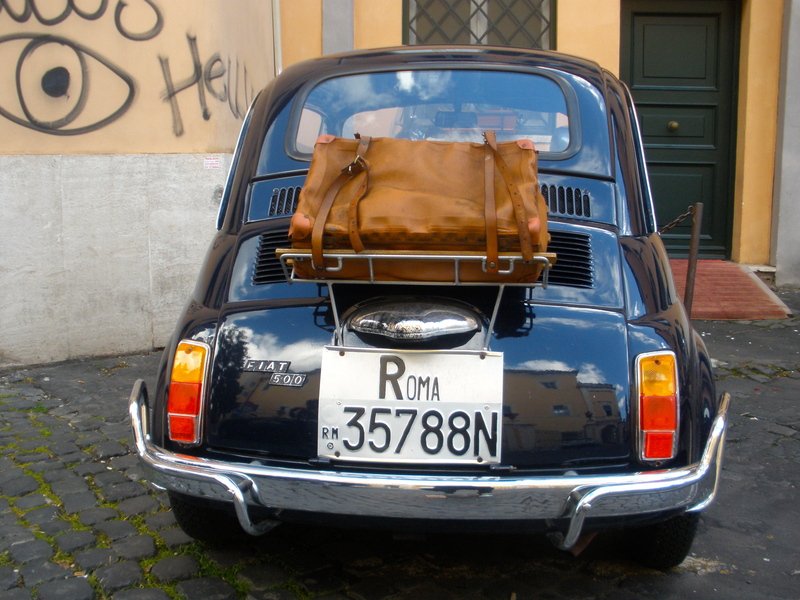 Take the train from Roma Termini station or rent a car and drive (recommended). Depending on the specific train It takes between 1 hr 15 min and 2 hr 33 min. The Eurostar is fastest and most expensive (29.50 euro); the regional trains are slower, but cheaper (11.70 euro). By car take the A1 Autostrada and expect to spend 2 to 3 hours depending on traffic. Described by Livy as one of the Capitae Etruriae (Etruscan capitals), Arezzo (Aritim in Etruscan) is believed to have been one of the twelve most important Etruscan cities. The historical center is easily walked and many will recognize the Piazza Grande from the movie, A Beautiful Life. We were fortunate to stay with friends who are living in Arezzo and spent an entire day outside of the city driving the back roads to two places that I highly recommend visiting if you can, The ancient hill town of Poppi and the Hermitage and Monastery of Camaldoli (Sacro Ermo). Both places are incredibly beautiful!! Poppi offers amazing vistas from the Castello dei Conti Guidi. You can climb the bell tower if you don’t mind heights and if you time your climb to the hour you get an extra surprise. Additionally the the ancient library contains incredible printed volumes. 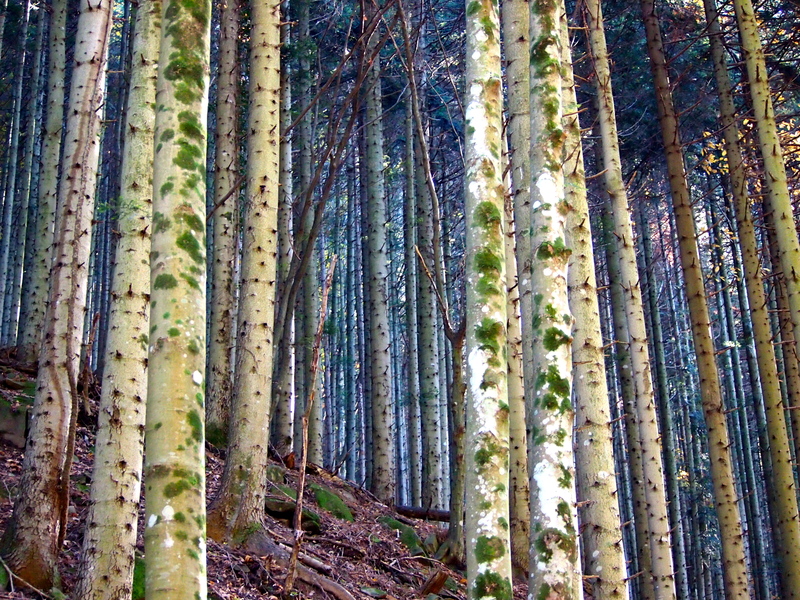 The hermitage and monastery founded about 1012 by Saint Romuald, a Benedictine monk, is situated in the National Park of the Forests of the Casentino in Tuscany and is accessible by walking (recommended – 4 km total) or car. 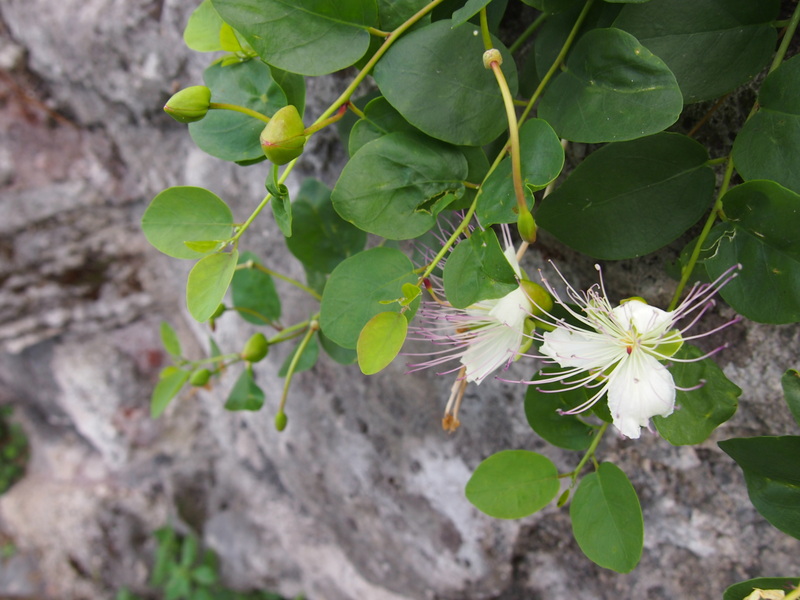 Make sure you visit the old pharmacy – originally a laboratory where monks studied and worked with medicinal herbs. You can still buy a variety of herbal remedies. Driving through the hills of Tuscany is an amazing experience for the senses! Make sure you bring your camera and your appetite. Buon Viaggio! Assumption Day on 15th August is when all Italy, or so it seems, stops work to celebrate. What Italians are actually celebrating on that day is actually quite interesting because the festival has elements of both the ancient and Christian worlds. The term Ferragosto is derived from the Latin expression Feriae Augusti (Augustus’ rest), which is a celebration introduced by the emperor Augustus in 18 BC. 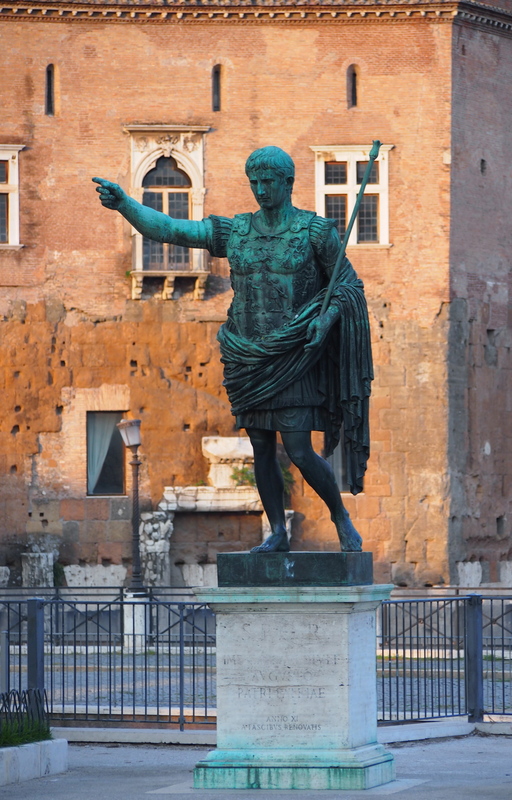 The present Italian name of the holiday derives from its original Latin name, Feriae Augusti, “Festivals or Holidays of the Emperor Augustus”. The popular tradition of taking a trip during Ferragosto arose during Fascism. In the second half of the 1920s, during the mid-August period, the regime organized hundreds of popular trips through the Fascist leisure and recreational organizations, and via the setting up of the “People’s Trains of Ferragosto”, which were available at discounted prices. The initiative gave the opportunity to less well-off citizens to visit Italian cities or to reach seaside and mountain resorts. The offer was limited to the 13th, 14th and 15th August, and comprised two options: the “One-Day Trip”, within a radius of 50-100 km, and the “Three-Day Trip” within a radius of about 100–200 km. For many families, it was only during these trips that they saw the sea, mountains, and Italy’s many artistic marvels for the first time. Moreover, since the trips did not include food, the connected tradition of the packed lunch arose. The Roman Catholic Church celebrates this date to commemorate the Assumption of the Blessed Virgin Mary—the actual physical elevation of her sinless soul and incorruptible body into Heaven. Before the Church came into existence, however, this holiday also included honoring of gods—in particular Diana—and the cycle of fertility and ripening, during the time of the Roman Empire. 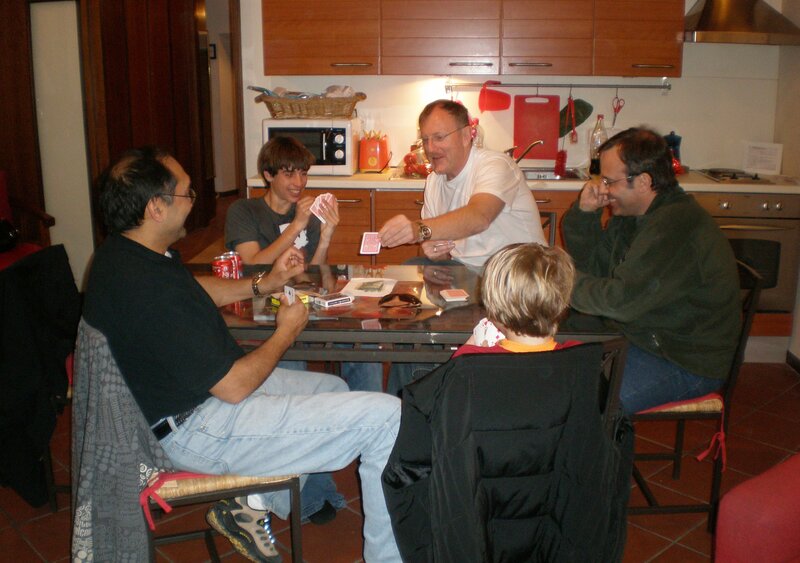 Looking back through my travel journals I realized that one of the most often enjoyed activities were the many card games played with our family and friends. The two most popular games being Scopa and Briscola. Joe’s father Richard taught me how to play both games which he learned from his father who grew up in Sicily. While Scopa and Briscola have different rules they both utilize the same deck of 40 cards, beautifully illustrated, which are divided into four suits. As all things in Italy there is variation of the four suits depending on the area of the country. The southern cards: Neapolitan, Piacentine, Triestine, and Sicilian are divided into Coppe (Cups), Ori or Denari (Golds or Coins), Spade (Swords) and Bastoni (Clubs), while the northern cards: Piemontesi, Milanesi and Toscane use the French suits, Cuori (Hearts), Quadri (Diamonds, literally “Squares”), Fiori (Flowers) and Picche (Spades, literally “Pikes”). The designs have evolved over the centuries and one of my favorite books which illustrates this evolution is Passione collezionismo Carte Do Gioco by Frederique Crestin-Billet. Throughout my travels I would look for antique, unusual, or highly decorated decks of cards. This can quickly become an obsession. While we often played cards late in the afternoon before dinner, in our apartment or hotel, we sometimes played cards at one of the local cafes. If I could suggest one tip for getting to know locals this would be it – break out a deck of cards. There are more than 900 churches in Rome most Catholic but not all. Of these, there are four major basilicas in the city which fall under the direct supervision of the Pope – Basilica of St. John Lateran (Also the seat of the Bishop of Rome) Basilica di Santa Maria Maggiore, Basilica of Saint Paul, and St. Peter’s. Visiting any one of these many churches will provide you with a crash course in history, architecture and art. Some of my favorites are listed below with a short rationale of why. You could live your entire life in Rome and not visit all of these remarkable structures. If you find yourself walking past a church and the doors are open I encourage you to go inside – you never know what you will discover. Everything from Bernini sculptures to Caravaggio paintings to some interesting relics are housed within these houses of worship. Crypt of Balbi – you can see in detail the layers of Roman civilization from the earliest days through the Middle Ages and Renaissance. It is like one big layer cake that you get to walk through and actually see and touch the layers. Also very near to the Largo Argentina where Caesar is reputed to have been assassinated. 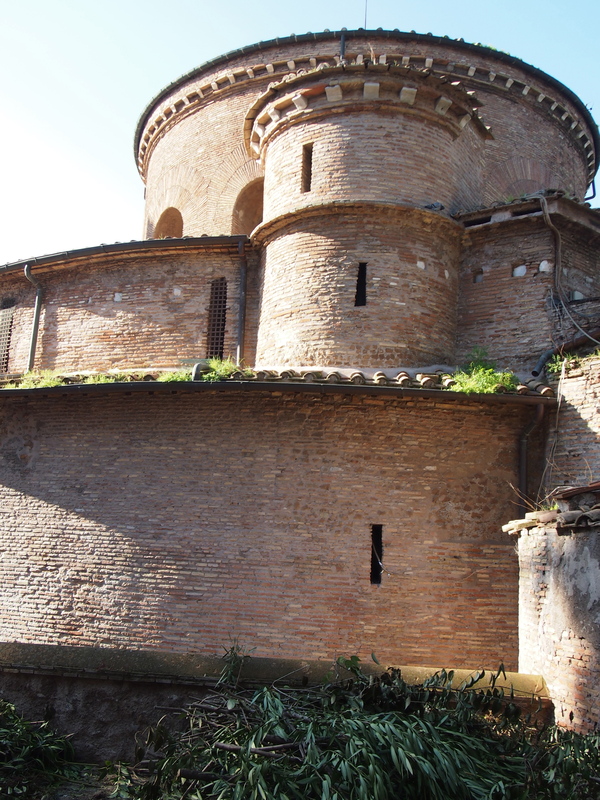 Santa Cecilia in Trestevere – Somewhat out of the way this church was built over the upper class home of it’s namesake. Be sure to tour the excavations under the church. San Luigi dei Francesi – Near the Piazza Navona and the Pantheon this church houses three spectacular Caraviaggio paintings, among which include the Calling of Saint Matthew, one of his most powerful works. Santa Maria sopra Minerva – The only gothic church in Rome. I recommend visiting late in the afternoon when the setting sun is directly in front of the entrance. Before entering, take your picture in front of the famous Bernini baby elephant carrying an obelisk. Among the many notable works of art inside is a wonderful sculpture by Michelangelo, a muscular Christ Bearing the Cross.